Preheat your oven to 425 degrees F with the rack in the middle. Cook the mushrooms, 1/4 teaspoon of salt, the garlic, and 1/8 teaspoon pepper in oil and 1 tablespoon of butter in a 4 quart heavy saucepan over medium heat. Stir occasionally until the mushrooms have softened, about 3 minutes. Add the wine and simmer for 2 minutes. Transfer the mushroom mixture to a large bowl and stir in the chicken. Set this aside. Bring the milk to a bare simmer in a medium saucepan. Melt the remaining butter (4 tablespoons) over medium-low heat. Add the flour and cook the roux, making sure to whisk constantly for 3 minutes. Add the hot milk in a slow stream, whisking constantly. Add the thyme, 3/4 teaspoon salt, and 1/2 teaspoon of pepper and simmer, whisking occasionally until thickened (5-6 minutes). Remove from heat and reserve 1 cup of the sauce. 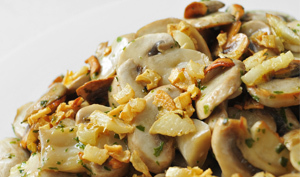 Stir Parmesan into the sauce that remains in the pan and then stir in the mushroom filling. Pour half of the reserved plain sauce into an 8 x 8 inch baking dish, spreading evenly to coat the bottom. Add 3 lasagne sheets, overlapping slightly. Add 1/3 of the mushroom filling, spreading it evenly, and then sprinkle 1/4 of the Gruyère over the top. Repeat these steps 2 more times. Top with the remaining 3 lasagna sheets and remaining plain sauce, spreading evenly. Sprinkle with the remaining Gruyère cheese. Cover the lasange with foil, making sure to tent the foil slightly as to keep it from touching the top of the lasange but sealing all around the edge. Bake the lasagna for 30 minutes. Remove the foil and bake until the cheese is golden, about 15 more minutes. Let the lasagna stand 10 minutes before serving.